While one can imagine, that a 3D surface could exist, that realizes all pairs of principal curvatures, because the set of all pairs of principal curvatures is, losely speaking, also 2D, it is counterintuitive that also a 3D curve could exists, that realizes all pairs of curvature $\kappa(s)$ and torsion $\tau(s)$ for $s \in (-\infty,+\infty)$. However, interpreting $(\kappa(s),\tau(s))$ as a parametric curve in the Euclidean plane, it is fairly easy to conclude, that $(\kappa(s),\tau(s))$ must be space-filling. what is the fractal dimension of 3D curves with space-filling $(\kappa(s),\tau(s))$ trajectory? what is the radius of the smallest 3D sphere into which such a 3D curve fits? what about selfintersection of the 3D curve? what about 3D curves, whose $(\kappa(s),\tau(s))$ trajectory has fractal dimension between $1$ and $2$, maybe resembling one of the prominent fractal 2D curves (cf e.g. http://en.wikipedia.org/wiki/Category:Fractal_curves)? have such 3D curves been described or studied? 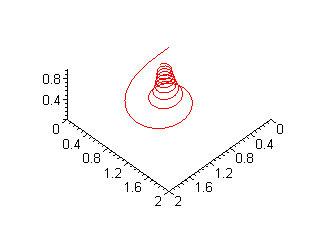 use a point sampling of the $(\kappa(s),\tau(s))$ trajectory, calculate the length of the trajectory between two adjacent sampling points and use that as the parameter range for a segment of a helix, whose curvature and torsion equal the coordinate values of the sample point. The desired 3D curve is then obtained by letting the number of sampling points tend to $\infty$. However, in that construction curvature and torsion are not continuous for the approximate 3D curves, but I'm not sure if that is an issue for the limit curve. use rectilinear approximations of the $(\kappa(s),\tau(s)))$ and smoothly piece together so called $Salkowski$ and $anti$-$Salkowski$ curves (cf e.g. http://www.uv.es/~monterde/pdfsarticlesmeus/CAGD-6.pdf); here I don't know, whether it can be guaranteed that $s$ simultaneously parameterizes the 2D trajectory and the associated 3D curve by length. This construction would fit Hilbert curves as spacefilling planar trajectories. for piecewise linear approximations of the trajectory use segments of 3D curves for which both curvature and torsion are linear functions of $s$; however, I could not find a description of such curves. I hope, that the above suggestions help in visualizing such strange curves and, at least approximately, allow answering other questions related to such strange curves. Concerning only "the task of constructing a 3D space curve from the planar (κ(s),τ(s)) trajectory," see this MSE question: One needs to solve a system of 1st-order DiffEqs (as you realize). Not the answer you're looking for? Browse other questions tagged dg.differential-geometry fractals or ask your own question. How many curves can fit on a sphere without intersecting? What is the analog of the “Fundamental Theorem of Space Curves,” for surfaces, and beyond? For a 3D Apollonian packing, do we really know that the Hausdorff dimension of the complement is approximated by the growth rate of curvature?